If you have used Scribie’s service before, you probably know about our high standards in terms of the quality and the accuracy of the transcripts. So a very important question that comes to mind is, how is Scribie able to churn out 99.9% accurate transcripts all the time, while some industry players are afraid of even claiming that benchmark? The answer is best described in the form of a small paragraph. To start off, the entire transcription assembly line at Scribie was built for quality. While most transcription companies think a 2-step check is enough to attain “decent” quality, for us at Scribie “decent” simply does not cut it. That is why we doubled down on the efficiency and the grind of the process to make sure that we do way better than “decent”. In fact, it is safe to say that Scribie’s transcripts are arguably the most accurate ones you will get your hands on. It is not magic. But shrewd air-tight process. We did not settle for a “decent” 2-step process, we have an efficient 4-step process optimized for one thing: QUALITY. It is no rocket science that, more the eyes that proofread the system the better is the accuracy of the transcript. And in our process, it is not just a transcriber and a reviewer who look at your file before it is out for delivery. But also proofreaders and a QCs who have been selected amongst the thousands of transcribers who sign up with us. PS: The chances of someone making it to the Proofreader or the QC level is as small as an MBA candidate applying to Harvard Business School. We’re not kidding. So two factors: 4-step system & High caliber of transcribers help us achieve high-quality output. But combine this with our AI enabled tools and you are talking about nothing the highest quality of transcripts from Scribie. This is one of the innate advantages of building something with quality as the primary goal. Hence, it is not surprising that our customers are our biggest sales channel. And how do we return the favor? 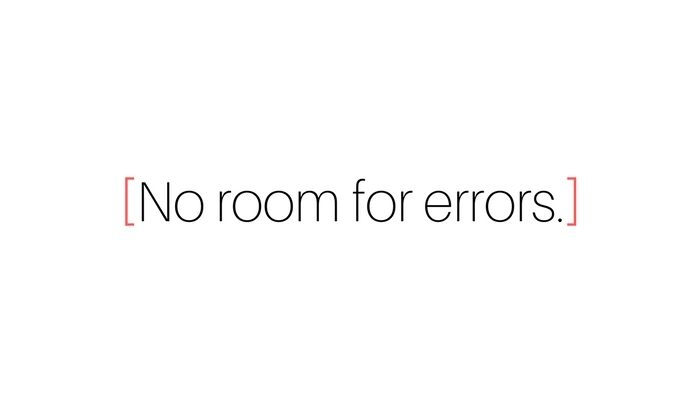 We do not give “any room for errors”. We make sure that every transcript that they get is the best in class. We do that and the other things take care of themselves.